Oh, I lied! I’m back. I just have to add a few love words for these bacon sugar cookies. Guys, bacon sugar cookies. 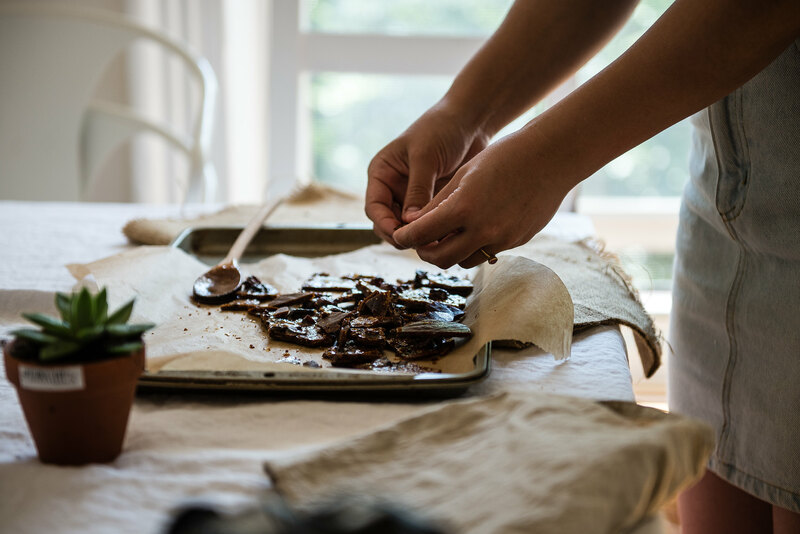 Molly had the brilliant idea of rolling the cookies in this ground-up toffee-like caramelized sugar-bacon ambrosia called “bacon brickle,” which was, in scientific terms, somewhere between crack and fairy dust. And then we felt like maybe it was a little too healthy, so we swapped out some of the fats in the cookie for bacon fat. Of course. I maybe wouldn’t eat a million at once, but I would definitely eat one each day for the rest of my life. Insanely good. Yield: 16-18 ice cream sandwiches. Ice cream recipe barely adapted from Jeni’s Splendid Ice Creams via Saveur Magazine. 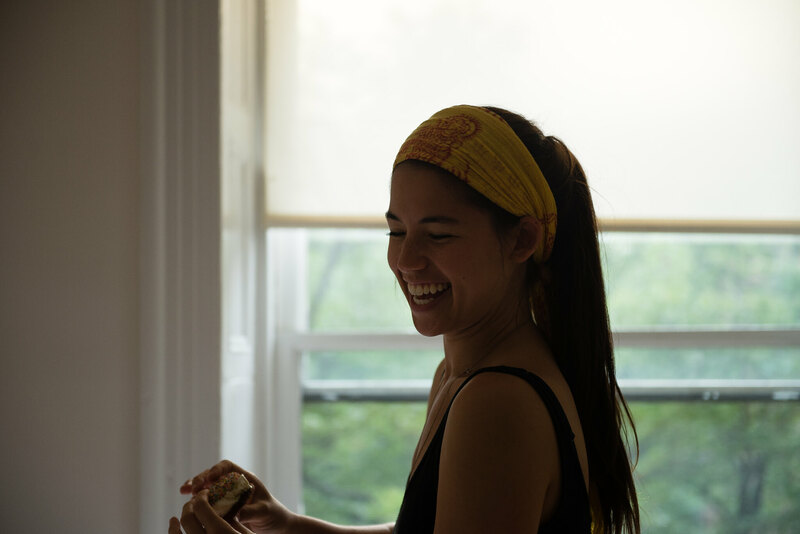 Sandwiches inspired wholly by Molly Yeh. For the ice cream: In a bowl, stir together the cornstarch and 1/4 cup of the milk, and set aside. 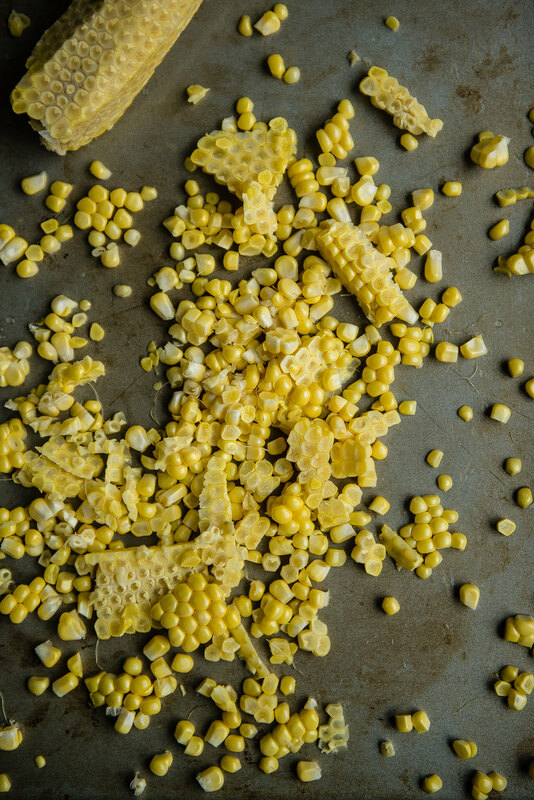 Cut the kernels off the corn cob and cut the cob into large chunks. In a medium pot, whisk together the remaining milk, cream, sugar, syrup, and salt. 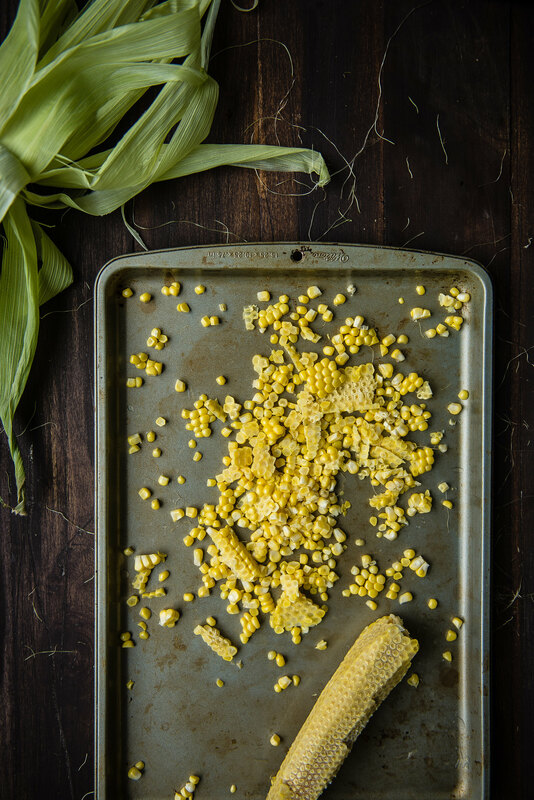 Add the corn kernels and cob, and bring to a boil over medium-high heat. Cook for 4 minutes, stirring continuously. If the mixture becomes too frothy and threatens to boil over, partially or totally remove from heat for a few seconds until it calms. I found that scooting the pot halfway off the burner and continuing to cook worked well. Place cream cheese in a bowl and pour in a small amount of the hot milk mixture. Whisk until smooth, or use an immersion blender to get out the lumps. Whisk in the remaining milk mixture, then pour mixture into a plastic bag, seal, and submerge in a bowl of ice water until chilled. Once cold, pour mixture into an ice cream maker and process according to manufacturer's instructions. After churning, freeze in a storage container while you make the cookies -- at least 2-3 hours. For the cookies: Bake according to this recipe. 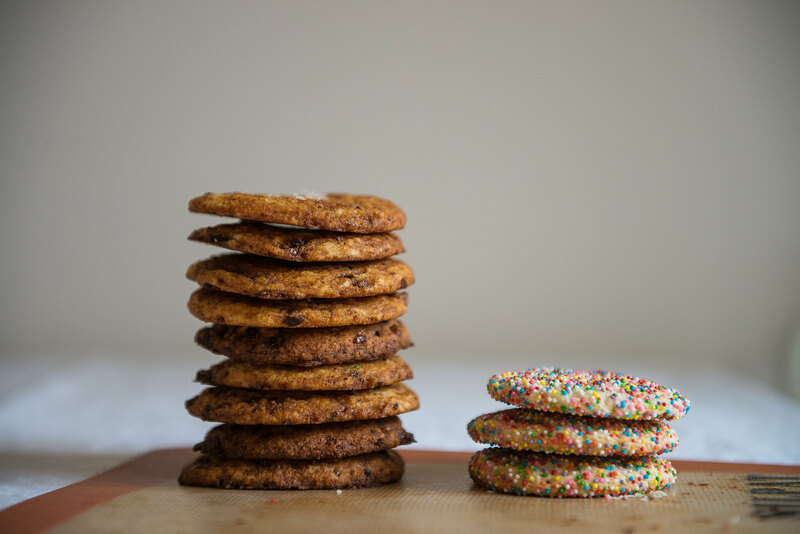 To assemble: Once cookies have cooled, remove ice cream from freezer and let soften slightly. Place a scoop of ice cream between two similar-sized cookies and squeeze gently to press them together. Repeat with remaining cookies and ice cream. 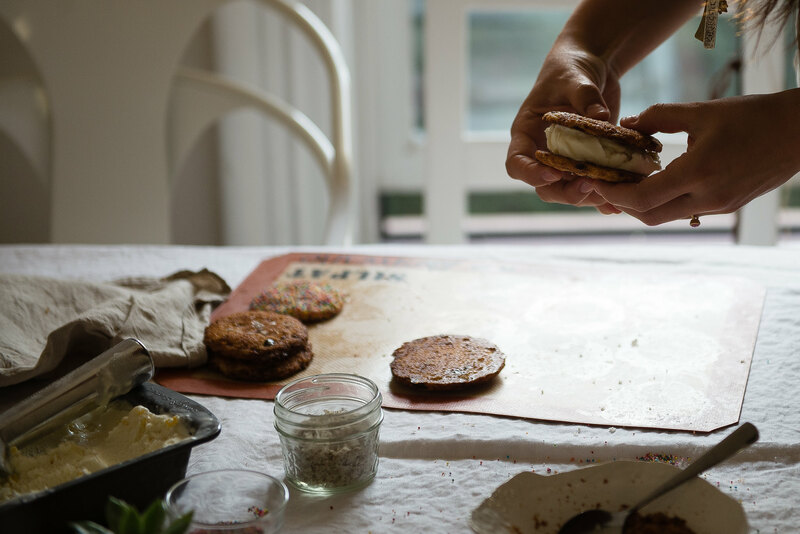 Place assembled ice cream sandwiches on a baking sheet and cover with plastic wrap, then replace in the freezer for 1-2 hours, or until hardened. After that, enjoy or wrap individually in plastic wrap for later. 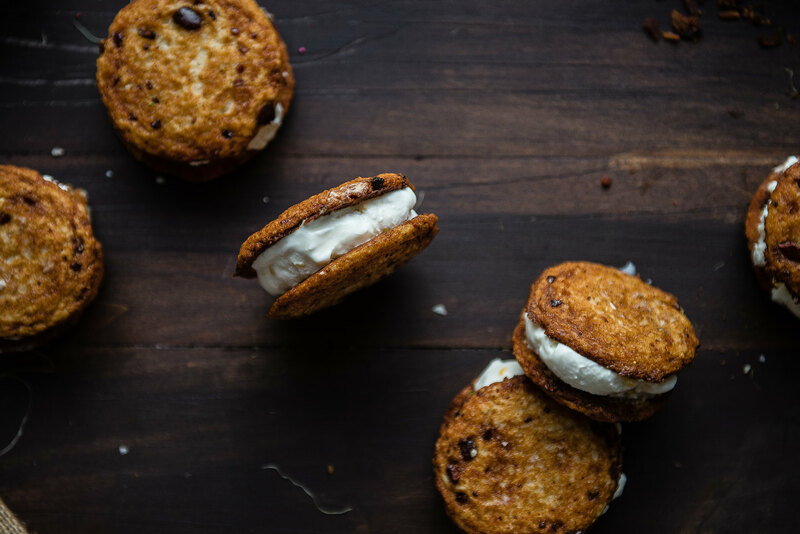 Cookies are best in the sandwich when on the underbaked and softer side -- if they're too soft to stand up to the ice cream at room temperature, pop in the freezer for 10-15 minutes before assembling sandwiches. Seeing your two inspiring minds work together is like…BOOM! Love, love, love this. No, actually I love both posts (spotted Molly’s first). So much indeed. 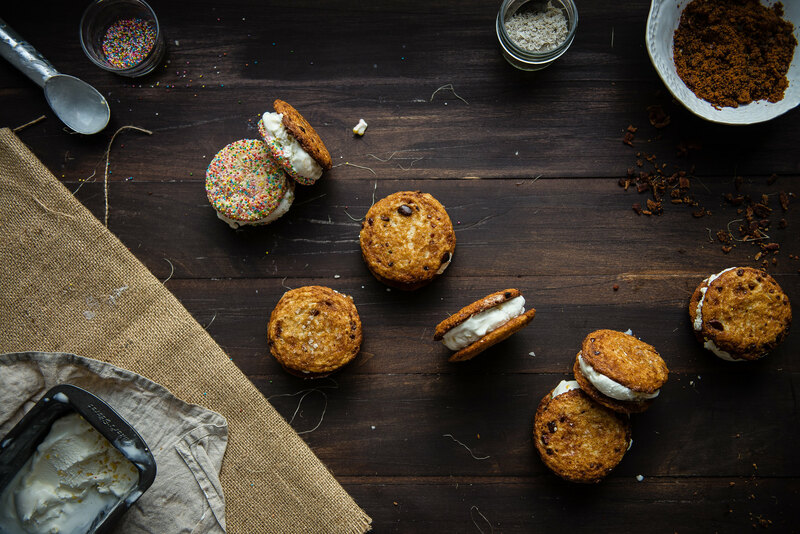 Gorgeous photography, AWESOME ice cream sandwiches (I mean BACON SUGAR! ), and action shoots without a tripod. Oh my gosh, oh my gosh! This post is the best. Two of my favorites in one place and with bacon ice cream sandwiches too! You two are both incredible and I swear, Molly’s smile could cheer any day up! 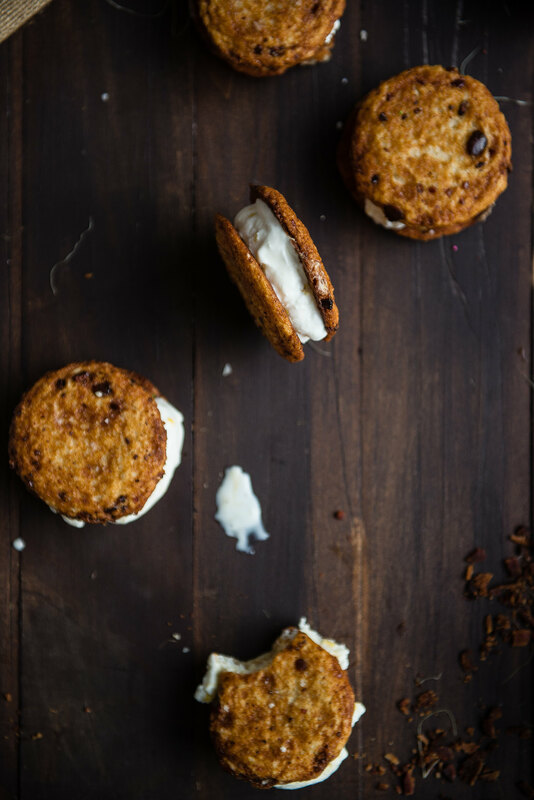 As could these ice cream sammie! Best collab EVER!! Love both of you and this post is so awesome Cynthia. 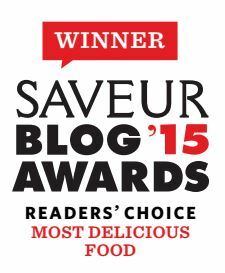 I have to try out bacon brickle – it sounds beyond amazing! This is so cool! I love both of your blogs and I love the collaboration 🙂 These are also so creative and look AMAZING. Thanks for sharing!! THIS is adorable. I totally want an ice cream sandwich and to hang out with you two. Such pretty pics! Awww! These are so cute! 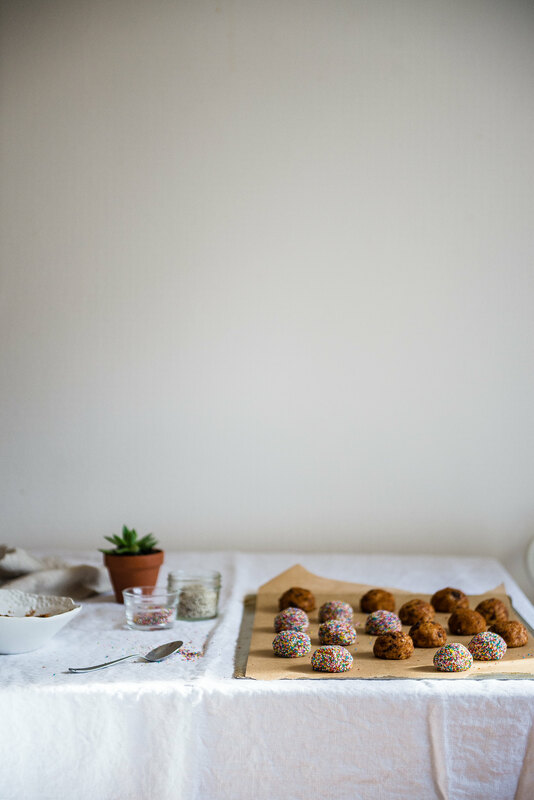 I am in love with both your blog so this combination post is rocking my day. You guys took Stella pictures and I hope you enjoyed eating the sandwiches. What a fantastic experience for you both and clearly a genius collaboration. That bacon brittle dust has got to be the next best invention on the planet. You girls rocked it! 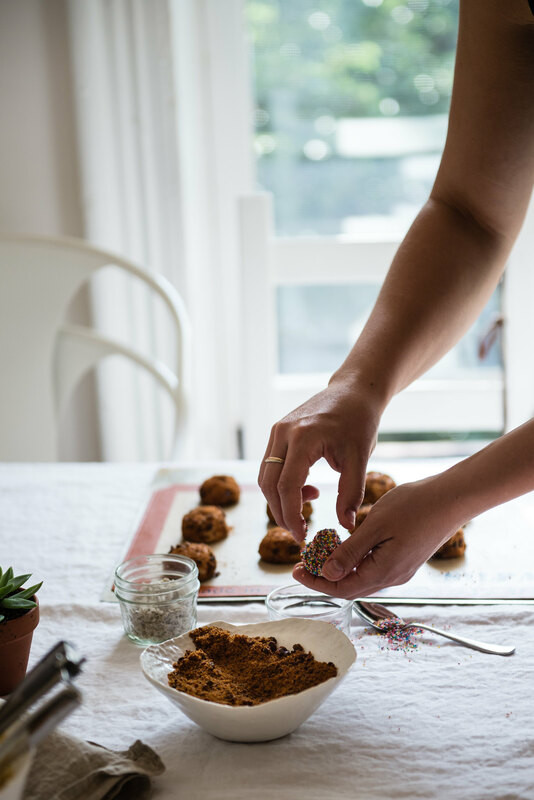 The photos + the recipe look absolutely wonderful. You guys are such a power couple!!!! You two are the cuuuuttttesttttt!!! okay, you and molly win the internet! i love this (and you guys) so hard! bacon and corn go hand-in-hand (hmm, like you guys?!) and so do ice cream and cookies. SO GOOD. oh an i especially LOVE seeing the different shots you guys got!! so fun! Ermagawd, I need bacon brickle in my life and in my mouth like, yesterday! Girl, what an incredible experience. I adore and worship the both of you so MY dream afternoon would be a fly on the wall watching you guys at work. 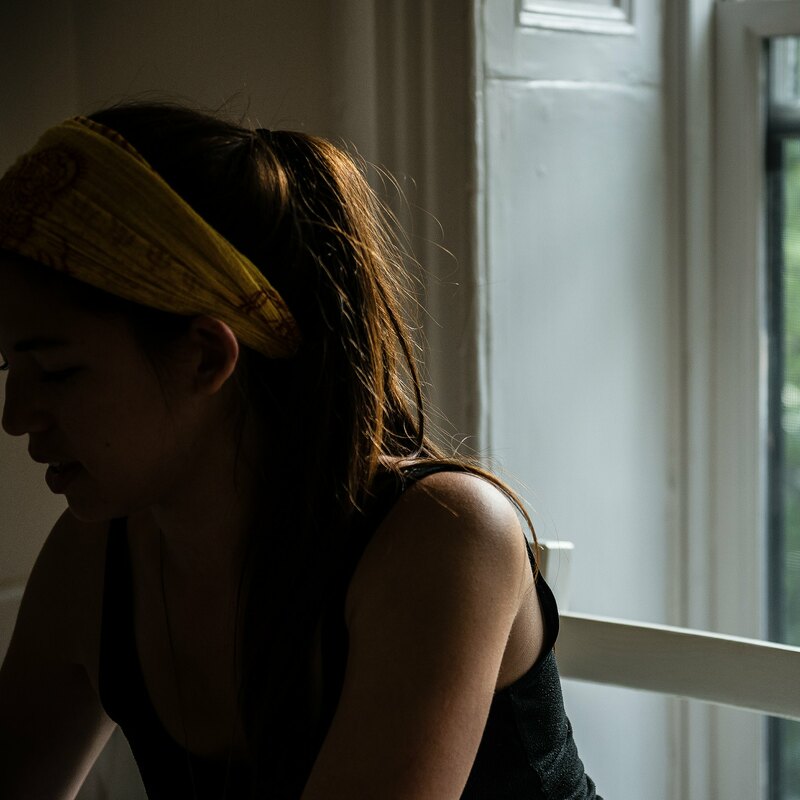 I wrote last week about how I’m so tired and uninspired when it comes to blogging. 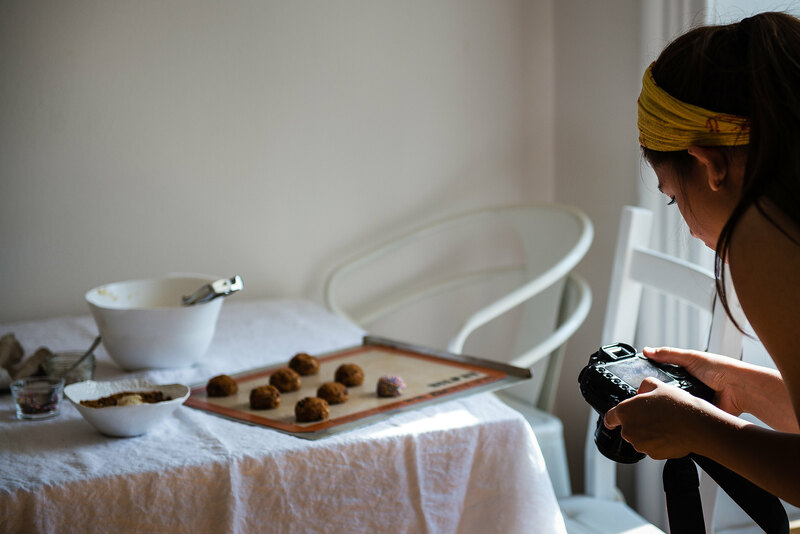 Getting to learn from and experience a new blogging/photography/baking perspective with someone I admire would totally give me a lift. 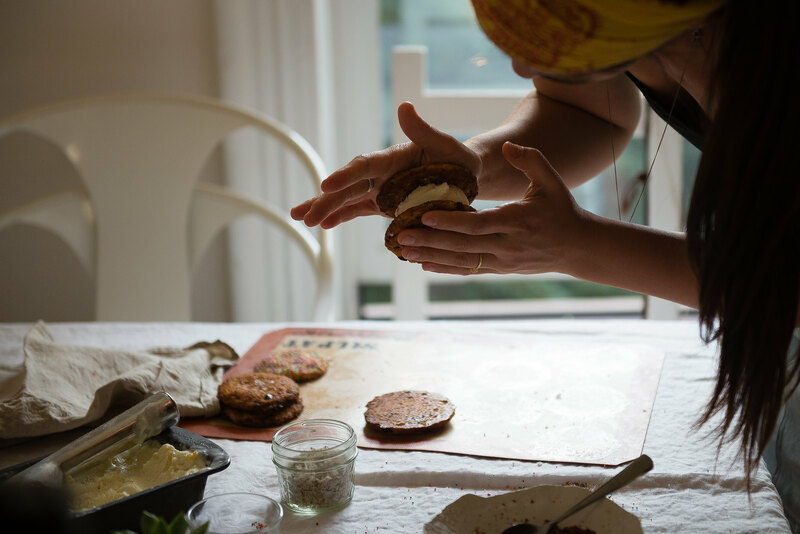 I love this post, love all the photos, and I need a few dozen of these beautiful bacon sweet corn ice cream sandwiches. Bacon cookies with corn ice cream. Delicious! ! What a fun post! It looks like you two had an amazing time together! 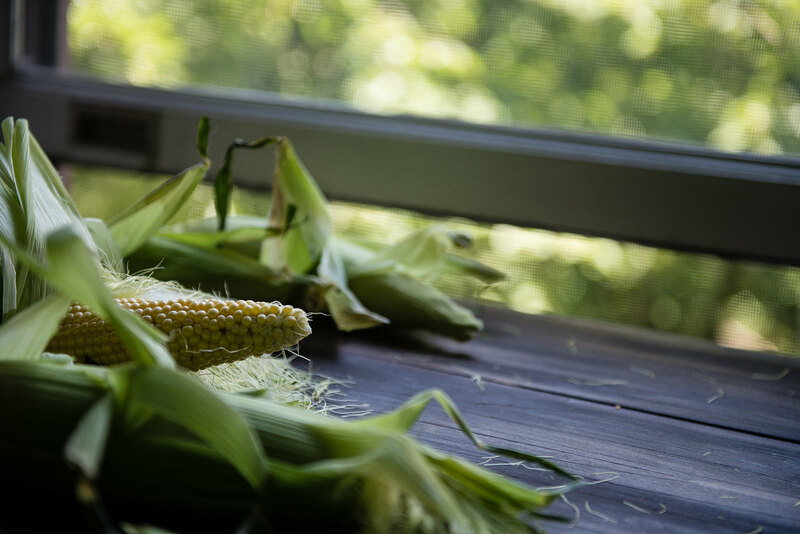 And I love what you created – I first had corn gelato at Cones on Bleecker street and I fell in love! I can only imagine how amazing it tastes with a bacon cookie!! I can totally feel the happiness of you two from SF. OMG!!! This is such a fun fun fun post. 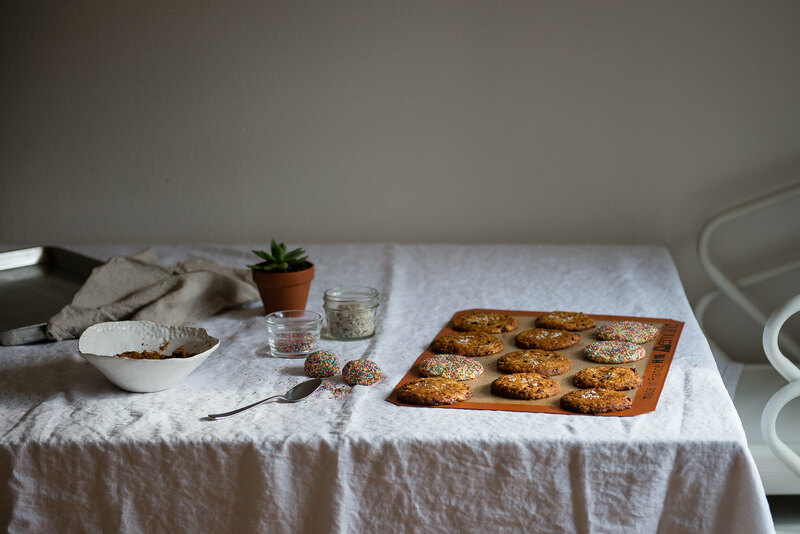 This collaboration is just so lovely & wonderful… I mean, bacon sugar cookies!!!! 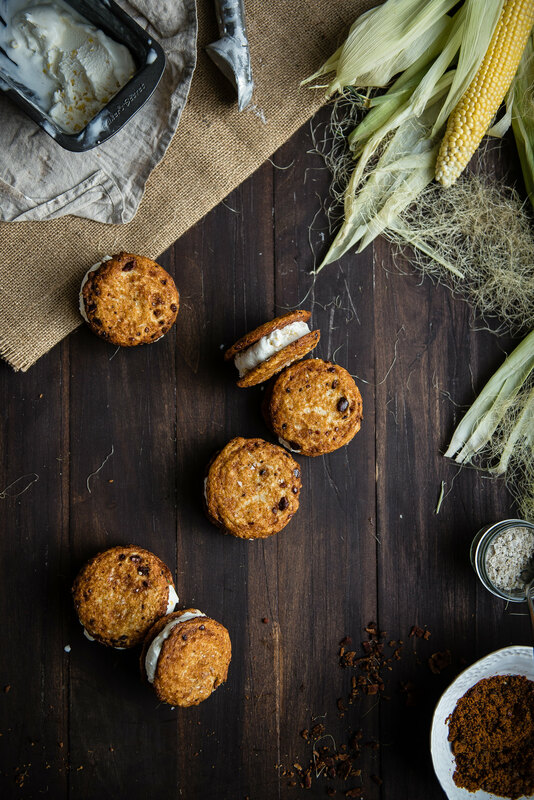 I want to just submerge my hand in my laptop and grab these ice cream sandwiches RIGHT NOW. I wish I could have been there to eat these! Swoooooon. this post makes me so happy 🙂 although, admittedly, i’d be happier if I got to eat a few of those ice cream sandwiches!! well done you two. what an awesome flavour combination. definitely a recipe i will be trying. thanks for the great post! Umm, totally jealous. Now you two need to come west coast and we can all have a food fest! Cuter than cute. You girls make my heart swoon. And ice cream churning in a bathroom shower–amazing. Mega-awesome combo all around. 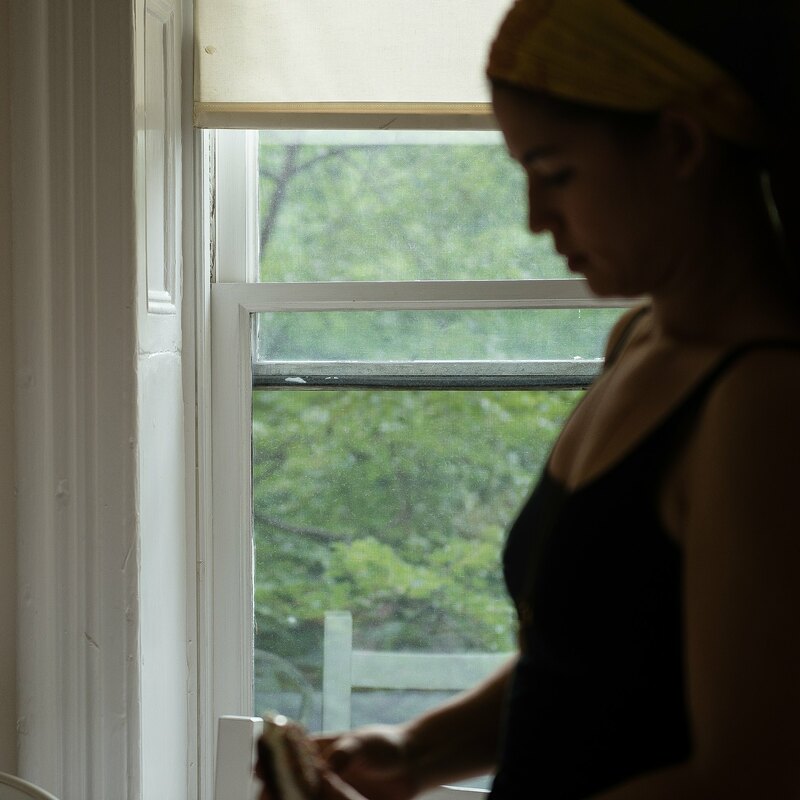 Clearly, I love you + Molly + these sandwiches but what I love most about this post is your thoughts about working and collaborating with someone else. It so interesting to see how you worked together and what you learnt from each other. 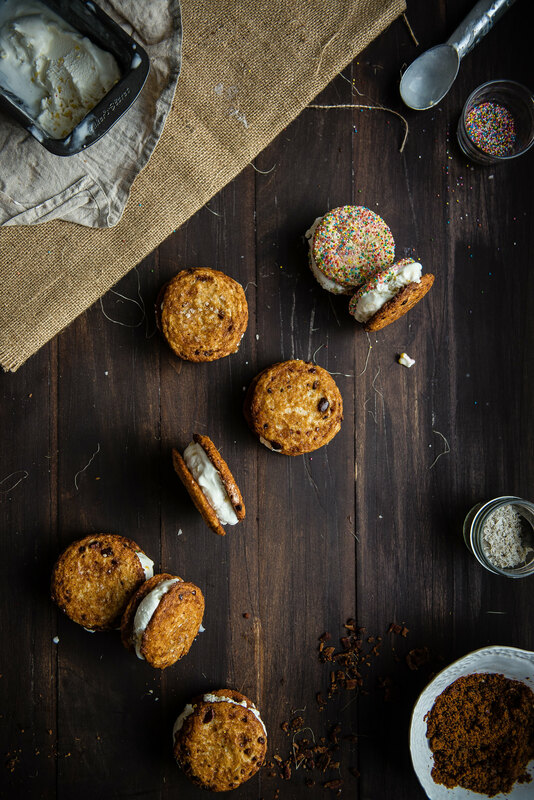 These ice cream sandwiches look divine! It’s lunchtime and I’m salivating at these photos. Also, out of curiosity, which one of you uses a Canon and which one uses a Nikon? 🙂 I use a Nikon. Thank you so much for your sweet words!! I’m a teensy tiny bit jealous but mostly 1000x in love with this post — how fun!!! I made sweet corn & hatch chile ice cream last summer, but I have to say, the inclusion of cream cheese in yours completely trumps mine. Love it! 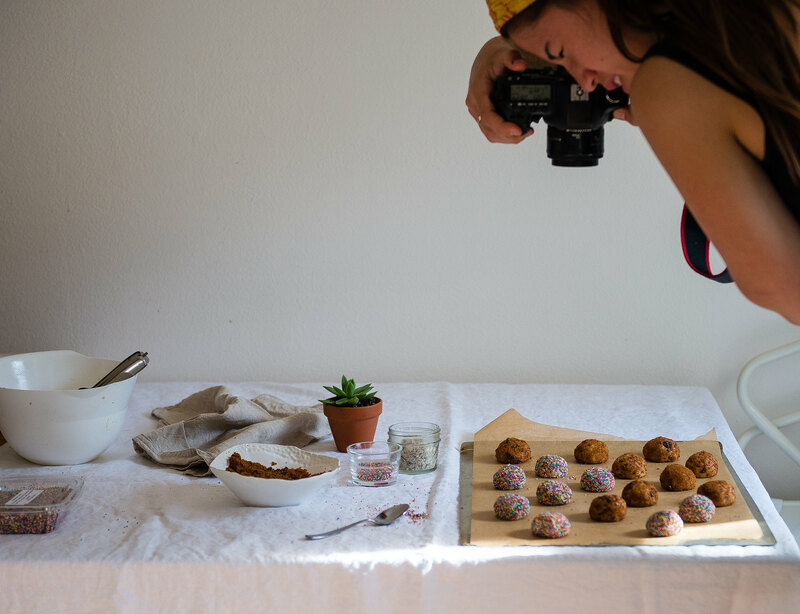 You and Molly Yeh = a match made in food/photography heaven. SO jealous of your get-together!! Sounds like so much fun. You guys have such great style–a collaboration was meant to be!